Gaming catch up, and more! I tend to talk about Warhammer a lot on this blog, which I suppose is fine because it is my blog and all, but every so often I like to branch out a bit and take a look at the wider world, and see what’s going on that I might have missed! Well, I thought today would be one such branch, as I take some time to catch up with what I’ve been up to and whatnot! I read this article on New Year’s Day, and I feel weirdly sad to see Christian Petersen leave FFG. I suppose it’s just a bit of fear of the new, and while I haven’t really been all that into FFG games of late (there was a time when they were the only publisher I bought from), I still feel a sort of attachment to the company, and of course, its CEO. I used to enjoy the In-Flight Reports during GenCon, and always thought he sounded like a cool guy. Hopefully we’ll continue to see amazing quality games coming from the company, anyway, and I hope we don’t get too much of a shake-up when he is replaced. Although I remain quite firmly convinced that Lord of the Rings LCG is going to be saying farewell soon enough! There was another preview for the Arkham Horror LCG on the same day, showing Tarot cards as a new type of player card for the game, which sound like an interesting idea. Over the festive period, I started the ball rolling with building a couple of new investigator decks for the game, as I’m intending to finally get around to the Dunwich Legacy! It’s been a few years now, of course, but I’m looking forward to seeing what the game has in store for me as I venture beyond the core set! Stay tuned for updates on that one – Arkham Horror LCG is definitely a fun game, and if you’re a fan of the lore, it certainly has a lot to offer! In 2018, I played a grand total of 47 games. I used to play that many in a month, so this is a definite down-turn, but in December I started making a conscious effort to try and play more. That was certainly helped by playing the Harry Potter deck-building game with Jemma over Christmas (I’ll have to get round to featuring that on the blog sometime soon!) Excitingly, she has said that playing that game has made her better-predisposed to trying stuff like Lord of the Rings again, so hopefully we can trudge off into Mordor together soon! The new set, Ravnica Allegiance, is coming out at the end of the month, and is quite exciting for me as it features two of my very favourite guilds, Rakdos and Orzhov. While I did buy some bits for the last set, Guilds of Ravnica, as it only had Dimir as a guild I usually play I wasn’t entirely fussed with it. I did actually build a Boros deck, as I ended up with a lot of those cards in the packs I picked up, and I do like playing Boros on occasion, but I am particularly looking forward to the Rakdos and Orzhov cards this time around, as well as another perennial favourite, Simic! The new mechanic for Rakdos is Spectacle, which offers an alternative casting cost if an opponent lost life this turn – in keeping with the classic Rakdos, Lord of Riots guild leader, naturally. They’re discounts on some cards, and increases on others to yield enhanced effects. Speaking of the cult leader himself, he’s getting a new card – Rakdos, the Showstopper – as are many guild leaders of old, such as Lavinia and Zegana. 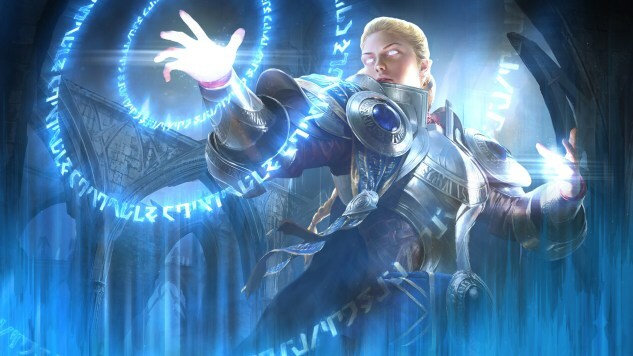 Each guild also gets a new Legendary Creature, which will be fun for Commander, and there are a couple of new Planeswalkers, including Kaya for the Orzhov (last seen in Conspiracy 2, so that’s fun the ghost assassin is now in a regular set). Orzhov is getting an interesting new mechanic, Afterlife, which creates a 1/1 Spirit token when the creature with Afterlife dies. It wouldn’t be Orzhov without seeing Teysa again, and of course she’s back with new token shenanigans, which I’m sure will make her a powerhouse when she comes into the wild. Granting tokens vigilance and lifelink is lovely, and causing a trigger to occur twice just makes Afterlife so much more powerful on its own. She’s going to be a hit, I’m sure – I’m just a little sad I probably won’t be able to get her outside of a lucky pack opening! Simic has Adapt, which allows you to put +1/+1 counters on a creature if there aren’t any by paying the Adapt cost. Given the number of counter-synergies within Simic guild cards alone, I can imagine Commander players are going to get a whole lot of fun out of using these mechanics with older iterations from the guild. I can certainly see myself adding in a few to my Prime Speaker Zegana deck, for sure! New Zegana still gives some card draw, but acts a bit like a Lord for all cards with a +1/+1 counter on them, giving them trample. Very handy. In case you aren’t interested in beating your opponent down the traditional way, Simic also has an alternative win condition with Simic Ascendancy, which allows you to put growth counters on it whenever you add a +1/+1 counter to a card – if Simic Ascendancy has 20 or more growth counters on it, you win! Cards like Hydroid Krasis, which enters the battlefield with X +1/+1 counters, or Combine Guildmage, who gives you an additional +1/+1 counter on any cards entering the battlefield for a turn, or Biogenic Upgrade, which allows you to distribute three +1/+1 counters across creatures you control, then to double the counters on that creature, will definitely help you get Simic Ascendancy close to 20 growth counters! Of course, that’s the dream, but even so! I think it’s safe to say that I’m a lot more excited for Ravnica Allegiance, at any rate!! Finally, I thought I’d have a brief ramble about a book I finished reading at New Year, United States of Japan. Taking as its starting point that the Axis won World War II, we see a very different take on the West Coast of America, as Japan is in charge of most of the area. There are pockets of American resistance, fighting out of the Rockies, but Japan holds California in an iron grip. The majority of the book takes place in the late 1980s, but it’s a lot more technologically advanced, with everybody using porticals (basically, smartphones) to play games almost constantly. This activity is strictly monitored by the authorities, so when a game called Unites States of America is suddenly made available, showing an alternate take on the end of the war, these rebels are shut down with maximum prejudice. The whole thing ends in a rather shocking denouement in San Diego, with the future fairly unsure for our protagonists. I went into this novel with a bit of trepidation, as I wasn’t sure it was going to be all that good. I’m not entirely up on my Japanese culture, and there were a number of references to it peppered throughout, but I found the book really easy to read, and positively raced through it. I do enjoy alt-histories like this, and I love a good post-apocalyptic storyline, so the fact that both elements were combined here was really quite fun. One of my main frustrations with the book, though, was that I found myself wanting to know more about the wider world than we were getting from the story. WW2 was said to end in 1948, then the novel leaps forward 40 years, with only a few fleeting references to what Germany was up to in Europe and on the East Coast of America. I know Peter Tieryas has written a second book within the same universe, which seems to deal more with a specific aspect of the universe than seeing things from a wider perspective, but I find myself wanting to know more of what this world could look like! Hopefully there will be a third book that might see that. At any rate, it was a real discovery for me in the final days of 2018, and I would say it’s definitely worth a read if you’re into alternative takes on stuff like this! Author spalanzPosted on January 12, 2019 January 12, 2019 Categories board gamesTags Arkham Horror LCG, Fantasy Flight Games, Magic the Gathering, novels, United States of Japan, Wizards of the CoastLeave a comment on Gaming catch up, and more!